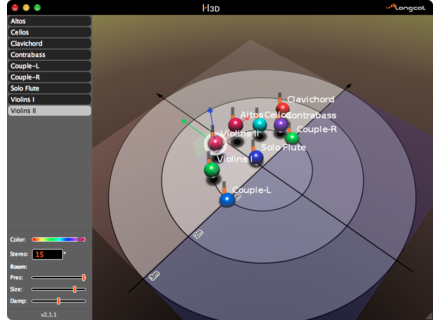 H3D Binaural 2, Surround Sound/Spatialization Software from Longcat Audio. Longcat Audio Technologies has announced a major update to H3D, their 3D audio binaural plugin for Digital Audio Workstations. H3D v2.0, along with a redesigned user interface, brings support for stereo tracks 3D spatialization and is now compatible with Mac OS X Lion. Aimed at musicians, sound designers or podcasts producers, Longcat’s H3D is designed to insert in major audio software (such as ProTools, Logic Pro, Digital Performer, Cubase, Live, Pyramix or Reaper), and to allow the creation of 3D mixes for headphones, by visually animating audio tracks in a 3D interface. 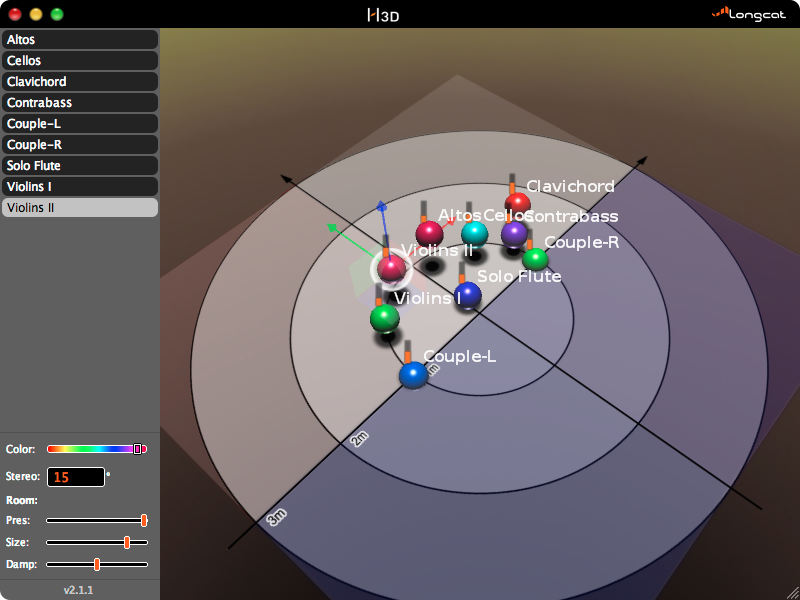 3D object-based mixing: use the redesigned 3D interface to visually place and animate stereo or mono tracks. Longcat Audio H3D technology: when listening on headphones, H3D allows panning sound in 3D around the listener’s head. HRTF processing: H3D uses Longcat own processed HRTF filters in order to achieve spatialization effects. H3D Reverb included: Longcat’s 3D dynamic binaural reverberation. Automation: automate parameters and 3D animation of audio tracks. Longcat is offering a special -20% discount on H3D valid until November 4, 2011 to all new clients. After that, H3D will available at 99€ (incl. EU VAT) or $117 (US, Canada…) in Longcat Audio’s online shop. Current customers will be able to upgrade to H3D 2.0 at little or no cost. An evaluation version is also freely downloadable on Longcat Audio’s website. Arturia Oberheim SEM V Arturia has revealed new details about its software synthesizer: the Oberheim SEM V.